During the Battle of St. Vith in the Battle of the Bulge, on 18 December 1944, an M8 armored car from Troop B, 87th Cavalry Reconnaissance Squadron and Company A, was able to destroy a German Tiger I heavy tank from 1st SS Panzer Division. The M8 fired three 37 mm rounds through the relatively thin rear armor of the Tiger from only 25 yd. (23 m), setting it on fire. Despite the fact that M8 Greyhound was not adversary for German tanks, statistics and specifications do not determine the result of the battles. 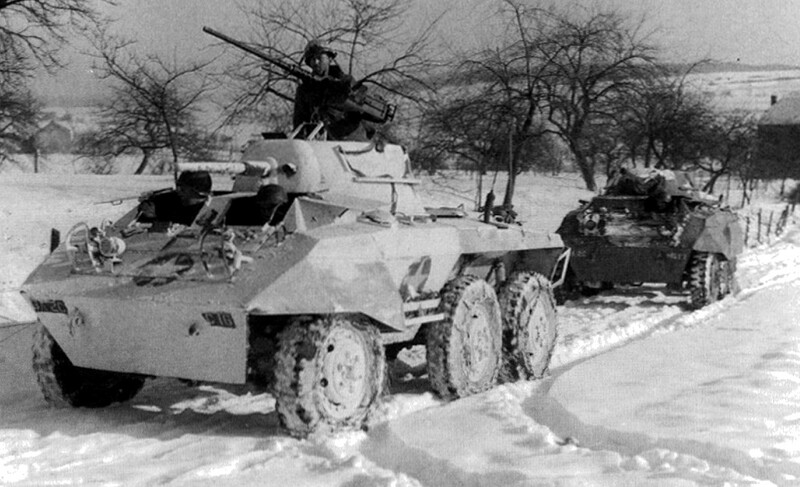 The M8 Greyhound was considered fast, sufficiently reliable and armed and armored well enough for reconnaissance missions. Its speed was key to successful in this engagement with Tiger tank. The armored car had been in a concealed position near the boundary of Troop B, 87th Cavalry Reconnaissance Squadron and Company A, 38th Armored Infantry Battalion, when the Tiger approached the lines at right angles to move along a trail in front of the main line of resistance. As the tank passed the armored car, the latter slipped out of position and started up the trail behind the Tiger, accelerating in an attempt to close. At the same moment the German tank commander saw the M8, and started traversing his gun to bear on it. It was a race between the Americans, who were attempting to close so that their 37-mm gun would be effective on the Tiger’s thin rear armor, and the Germans, who were desperately striving to bring their 88 to bear. Rapidly the M8 closed to 25 yards, and quickly pumped in three rounds; the lumbering Tiger stopped and shuddered; there was a muffled explosion, followed by flames which billowed out of the turret and engine ports, after which the armored car returned to its position. This action was reported to Major Donald P. Boyer, Jr., S3, 38th Armored Infantry Battalion, by Captain W. H. Anstey (commanding Company A, 38th Armored Infantry Battalion) who witnessed the engagement.